With Fold/Turn Brush you can animate open books, wavering flags and banners, a bird’s wings and the fins of of a fish. 1. 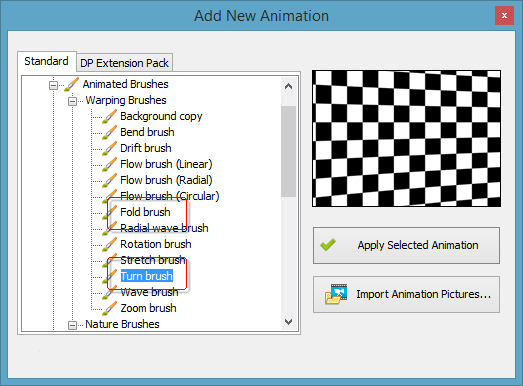 Select the Fold Brush or the Turn Brush from the Add New Animation dialog. Both brushes are located under the “Animated Brushes” section in the “Warping Brushes” subsection. 2. Click “Apply Selected Animation”. This adds the corresponding brush to the list of Animations at the right. 3. Paint with the brush over the object you want to animate. Adjust the settings if necessary. Type – this determines the behavior of the animated object. Soft – the fold/turn animation is smooth, and the object gradually changes its orientation relative to the axis. This type is good for natural movements: banners fluttering on the wind, birds hovering over the sea, leaves falling from, a tree and so on. Sharp – animates the object without smoothing its motion. It moves from end to end at a constant rate. Use the sharp type when the object is abstract or mechanical. Random – turning and folding is random. There is not a fixed pattern or rate here, the motion is completely chaotic. Constant, amplitude 1 – when this type is set, the object permanently turns or folds to the amount specified in the Amplitude 1 parameter, and does not animate. Constant, amplitude 2 – the same as above for Amplitude 2. 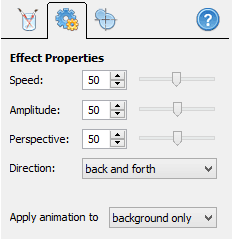 Use the last two options to synchronize how the object turns and folds with other animations in the timeline. You can read more about the timeline in DP Animations here. Speed – select the speed of the animation. The higher the speed, the faster the animated object turns or folds. Larger objects, like the sails of a ship, usually turn slowly. Small objects, like a butterfly, may require higher values. Amplitude 1 and 2 – these parameters set the extent the object should turn or fold. The first parameter is for motion from the viewer; the second one is for motion towards the viewer. Perspective – the higher this value is, the more the object is distorted by the perspective view. Think of this parameter in this way: if the object is close to the viewer, it distorts more while it turns or folds. If the object is far from the viewer, the distortions are less visible, so the value of this parameter should be smaller. You can specify the axis of Fold Brush or Turn Brush on this tab. The animated object turns or folds around this axis. You can modify the parameters on this tab manually, or simply use your mouse and drag the central point of the axis and adjust its orientation directly in the working area. Remember, you should always set the axis along the rotation line of the object. For example, if you animate a weathercock, you should set the axis along the axis of the weathercock. 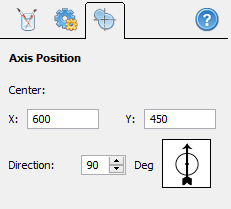 The Center parameter on the Axis Position tab specifies the center of the perspective view – a view specified by the Perspective parameter on the Effect Properties tab.